LONDON – Closer dialogue, focus on concrete results, a realistic, pragmatic and state-by-state approach and “soft power” initiatives were among the key recommendations included in the Eurasian Council on Foreign Affairs’ (ECFA) report outlining proposals for the European Union’s (EU) upcoming Strategy for Central Asia. 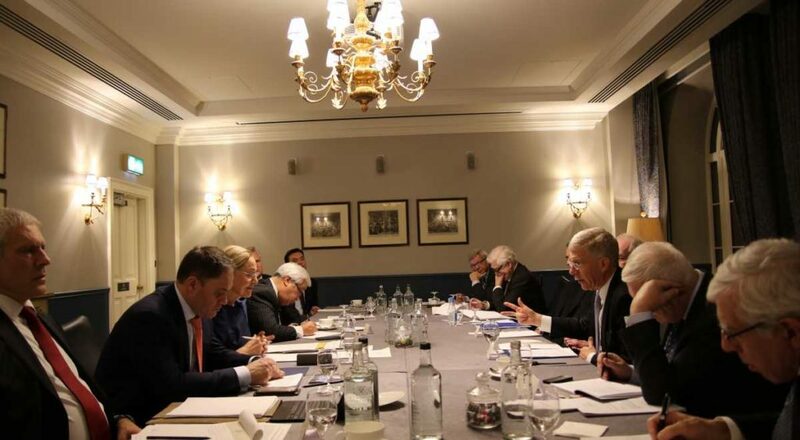 The report was officially presented Dec. 5 at a press conference at Cliveden House, a stately manor outside of London where ECFA held its fifth annual meeting. “Our analysis suggests that the European Union should direct its focus in a realistic and practical way that plays to the strengths of the EU. 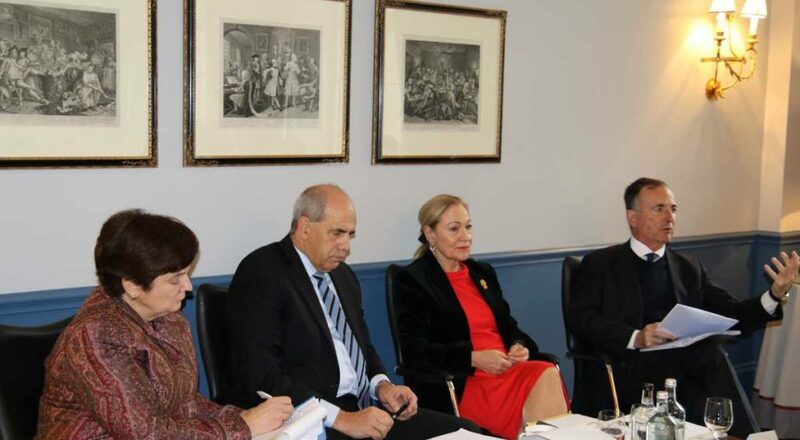 And we think that it has to be streamlined and focused especially on ‘soft power’ areas,” said former EU Commissioner for External Relations and current ECFA Advisory Council Chair Dr. Benita Ferrero-Waldner to open the press conference attended by other members of the council including the former presidents of the Czech Republic, Poland, Slovenia, and Serbia. The report includes expert contributions from 16 international institutions including the United Nations, European Bank for Reconstruction and Development (EBRD), Organisation for Economic Co-operation and Development (OECD) and several universities. Former Italian Foreign Minister and Chamber President of the Italian Council of State Franco Frattini presented the report, outlining the key recommendations addressed to the European External Action Service aimed at helping make the strategy more effective. He noted the strategy must first of all use the lessons learned from the past experience of negotiating and implementing the current strategy for Central Asia, first devised in 2007 under the German EU presidency. These include increasing the EU’s visibility in the region, narrowing down the projects and areas of cooperation with the aim of enhancing their efficiency and considering the opinions of the regional states, while avoiding unnecessary competition with major regional actors such as China and Russia and enhancing coordination among European countries. “We also have to have in mind that our interlocutors sometimes felt the ‘Eurocentric’ approach from European institutions – what some used to define as the ‘teach and preach’ approach, where European institutions tried to dictate to our interlocutors what they should or shouldn’t do. This is another element that in some cases made our interlocutors quite reluctant to fully engage in open cooperation with the European institutions,” he said. While the current state of EU-Central Asia relations is good, there are still many goals to achieve, he added. The main goals in the region today should be about working for concrete results and applying a pragmatic approach. This implies a shift from a conference and dialogue-based relationship to a more practical and operational approach with specific projects aimed at achieving tangible results, the Italian politician noted. The report also recommends the EU adopt a state-by-state approach in relations with Central Asian countries. The previous strategy applied a blanket approach that didn’t consider regional differences, Frattini said. The report deliberates on the “soft power” initiatives where the new strategy should focus, noting they would include improving health services, justice and law enforcement, as well as fighting corruption. The new strategy should also aim to continue supporting foreign direct investment in the Central Asian region while accounting for significant shifts in the regional economy, including the move towards digitisation and creating the Astana International Financial Centre (AIFC), an important new hub operating under English common law, notes the report. Instead of competing with the Eurasian Economic Union and China’s Belt and Road Initiative, the EU should enhance cooperation. This should become another goal of the new strategy, Frattini said. Concluding his presentation, he noted the EU should focus its work in the Central Asian region in certain key areas including security, education, sustainable development, including water management, and investment. Speaking at the event, EU Special Representative for Central Asia Peter Burian confirmed the EU is currently finalising consultations with its partners on the new strategy. The purpose is to get feedback from EU partners in the region, international organisations and financial institutions. “Within this very large consultation process, we have heard many of those suggestions and proposals and we probably need to go down to earth and narrow down the number of priorities to increase their results [which], I think, will be reflected in our strategy,” he said. Burian noted the main difference between the current strategy and the new one is the completely different atmosphere in the region, and a better understanding of the value of regional cooperation for addressing challenges the states are facing together. He was referring to the positive trends, prompted by the changes in political leadership in Uzbekistan, that have been taking place in Central Asian regional relations over the past two years and that have already produced notable differences in both bilateral relations and regional dynamics in trade and politics. The future strategy will focus, Burian added, on two key priorities – security and sustainable development. He agreed that rather than trying to pursue the “Eurocentric” approach by pushing certain solutions, the EU wants to base them on the national development strategies of the countries in the region. Because the key for economic diversification and economic stability is small and medium-sized enterprises, the EU wants to pay more attention to private sector development. The recent EU strategy on connectivity with Asia , which includes infrastructure, digital, energy and people-to-people connectivity, will also be taken into account in the new strategy. He suggested it should be viewed not as connectivity through Central Asia, but rather as connectivity in Central Asia. Burian noted the dramatic change in the region regarding Afghanistan – countries that used to see Afghanistan mostly as a threat, now see it as an opportunity, which provides an additional platform for cooperation. Kazakh Deputy Minister of Foreign Affairs Roman Vassilenko noted the approaches voiced at the press conference are remarkably similar to those proposed by Kazakhstan. “I would like to commend the European Union for the very elaborate and inclusive review process of the new EU Strategy for Central Asia. All of the countries were invited to submit their proposals, which we duly did, and many events involving various stakeholders took place in the region and beyond. So, I think the result of this process should be very coherent,” he said. He elaborated on the proposals Kazakhstan submitted to the EU, highlighting cooperation areas such as the rule of law, education, private entrepreneurship, with a strong focus on women entrepreneurship, and regional development. In terms of the mechanisms proposed by Kazakhstan, Vassilenko suggested creating a single online portal that would combine all of the strategy’s information and its supporting documents. The portal would make the strategy, its various platforms and projects as well as the opportunities this creates, more visible and understandable for businesses and individuals in both Europe and Central Asia. The EU’s new strategy for Central Asia for 2020-2027 is to be adopted in the first half of 2019 and will replace the current strategy.